What does $4.5 million and the help of a superdope homeboy from the Oaktown get you these days? Not much, if the just-out-of-beta Dancejam is any indication. 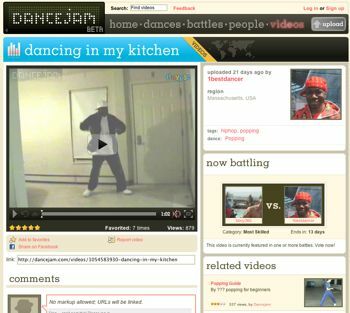 Dancejam is a YouTube clone that focuses on urban dance. The site lets you view videos of people doing various types of dance, rate the videos and upload your own. The Dancejam video player offers a few features that are designed specifically for learning dance steps – slow-mo and 5-second rewind buttons. You can’t adjust the volume of videos in Dancejam’s player. You can’t embed videos in other sites. There’s not much content. We counted a little over 500 videos, and many of these are duplicates. There’s no audience of users on the site. There are currently only about 1,000 users and few are active. As a result, the most viewed video currently only has 879 views. Dancejam looks DOA. It doesn’t offer standard features that you expect from a video site. And, while it targets a niche with with the potential for broad audience appeal, it doesn’t offer dancers a reason to use the site instead of YouTube. The challenges facing Dancejam are ones that will face any niche video site. If a site doesn’t offer some really compelling, unique features, there’s no reasons to prefer it over YouTube, which offers a mature platform and active member base, or just publishing on your own site.